Successfully Added High Definition Mini Pinhole Camcorder to your Shopping Cart. 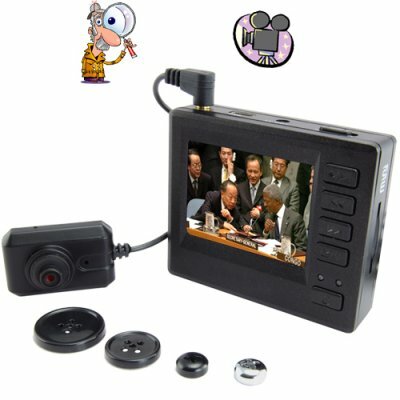 A high quality button hole mini camera system with stunning 720i resolution for professional and amateur detectives, sporting and other live event archivists, and those seeking visual evidence. Private Investigation: The CVSA-I22 is compromised of a high definition pinhole camera lens attachment that can be disguised as a shirt button and a pocket sized digital video recorder (DVR) which can easily be concealed in your pocket. One touch recording allows you to capture audio and 25 frames per second (fps) video in the popular AVI format. What's more, just stick in your own 8GB mini SD card and you can hold over 8 hours of quality video recording at the highest video resolution of 720 x 576! It's the perfect solution when dealing with suspects! Sports and Live Events: You're sitting ringside at the boxing match of the century. Wouldn't it be great to have a souvenir you could take home and watch over and over. This pin hole mini DVR lets you capture all the live event footage your heart desires! And because it employs a 1/4 inch CMOS imaging device, you can be sure of image clarity. So whether your passion is football, soccer, basketball or horseracing, the CVSA-I22 is your ticket to reliving "live" whenever you want. When you get home, simply download your videos to computer through the USB connection. Fan-tastic! Evidence Collection: Whether you need to video capture someone red-handed or in a compromising position, this amazing device delivers! Instead of wearing the camera system, you can also replace the pinhole lens with an external CCD surveillance camera and along with the unit's on-board 2 inch LCD screen you've suddenly got a versatile CCTV solution on your hands. Speaking of hands, move that mouse over to the "Add to Cart" button and click it right now to order one of these great videocameras for your own work or fun and then order some more as stock for your online shop. Brought to you by the leader in online direct from China wholesale electronics - Chinavasion. Buttons for DIY attachment to your " Shirt"
What is the AV OUT port for? You can connect the videocamera system to a TV or alternative display to view high definition video footage. What kind of fun can I have with this pinhole camcorder? OK here's a good one. Come home and ask your wife whether she's put on some extra weight. Then videotape her using every swear word known to man. I bought this gadget not for use as a spycam, but to be able to record directly from a TV. Yes. it can do that too! The quality is amazingly good for the size of the recorder. And the picture quality when using the tiny camera seems almost even better. on 2010-06-18 03:39:24 Fantastic product! This cam does what it promises. Best picture I've seen with this size of camera. My money is well spent. Fast delivery too! I just got this in and I can't wait to put it in to action. Quite impress with the quality of the picture. I have a Animal Spirit dance i need to film and there is very little light but my test so far looks like this will do the job. Will need to order a few more to capture the dance the way I want but I am excited what I will get with these cameras.